The ward or indoor duty uniform consisted of a white hospital dress, the white nurse’s cap, white stockings and white oxford shoes with rubber soles. A blue cape with velvet collar and a blue sweater could be worn over the dress if extra warmth was required.
. White Indoor Uniform . The white hospital dress made of starched cotton twill was closed by detachable white pearl buttons. It was worn with a detachable belt of the same material. The dress had a small breast patch pocket on the left side and a big patch pocket on the right side of the skirt. The cuffs were closed with white cuff links. 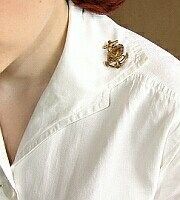 A pair of large pin-on Navy Nurse Corps insignia were worn on the collar. In 1944, the large NNC corps insignia were replaced by a miniature pin-on rank insignia worn on the right collar side and the new miniature corps insignia (without the NNC letters) worn on the left.
. These pictures show a later wartime variant of the indoor dress. The collar has notched lapels and the skirt can be opened nearly over the whole skirt length. ..
Due to the extreme difficulties of laundering and preserving the appearance of the white hospital dress in the Pacific Theater of Operations, Navy Nurses were authorized to wear the gray and white striped WAVES seersucker dress in August 1944. It was prescribed to wear the dress without tie, and open at the neck. 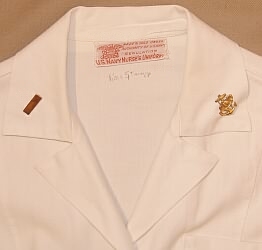 The miniature NNC device was pinned on the left side of the collar and the miniature pin-on rank and the right side. The outfit was worn with beige hose and black shoes. ...v For extra warmth, a black sweater could be worn over the indoor uniform. The sweater was eqipped with a button closure at the front and two patch pockets with buttoned pocket flaps. The NNC cape was made of dark blue wool with a high-standing velvet collar. The collar closed with hooks and eyes and a set of black frogs closed the cape over the bust. The lining was in maroon color. ......... A slate gray dress was authorized in May 1944. It was worn as a work attire equivalent to the male khaki uniform. Additionally, the uniform could be worn in lieu of the service dress white at informal occasions. The one-piece dress was made of a slate gray plain weave cotton, rayon, or tropical worsted fabric. 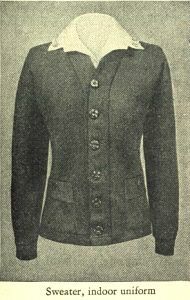 It had a double breasted shirt with a small breast pocket on the left side, a detachable matching cloth belt and a six-gore skirt with front kick pleat. 4 blue-black embossed plastic Navy regulation buttons were worn on the front of the shirt and 2 buttons on the belt. The long sleeves were closed with two smaller Navy plastic buttons on the cuff. A miniature pin-on rank was worn on the right collar and the miniature NNC insignia on the left. As headgear a matching slate gray garrison cap or the service cap with slate gray cover was worn. Black shoes, black handbag, grey gloves (later replaced by black gloves) and beige stockings completed the outfit. 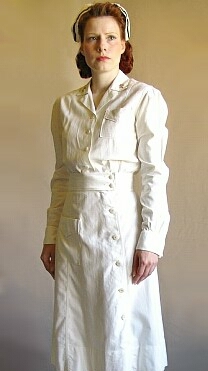 The production of the dress was discontinued in October 1946. .
Navy Nurse’s Non-Regulation Attire . The Navy did not provide nurses with their own distinctive female field uniforms during the war. It was unforeseen that Navy Nurses would work in overseas conditions requiring clothing with more freedom of movement and field protection than ordinary ward dresses. However, naval fleet or mobile hospital facilities were provided with only medical essentials and imposed sparse working conditions without extra water or equipment for laundry tasks. Therefore, the white nurse “work” dresses were often impractical in cases of forward deployment. This Navy Nurse caring for a native patient in a base hospital on New Guinea wears khaki trousers on account of the mud. .... Improvisation was necessary. Therefore, some Navy Nurses wore privately purchased clothing (for example, commercially available slacks) as a substitute measure. 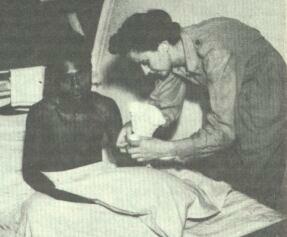 In addition, the nurses were often wearing male uniform khaki clothing because of its availability. This also provided better protection from sun and insects, and stayed cleaner looking longer than standard-issue ward dresses. This solution stemmed from necessity and the abundant stocks of military khaki clothing on hand. For example, in the Pacific theater Navy nurses wore khaki trousers, shirts and as well as men’s coveralls, raincoats and field shoes.
. 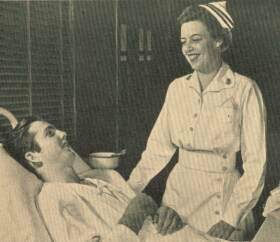 In addition to military khaki clothes, white shirts with blue slacks were another combination worn by Navy Nurses instead of their ward dress. (The wear of navy blue WAVES slacks was officially authorized in 1946.) . 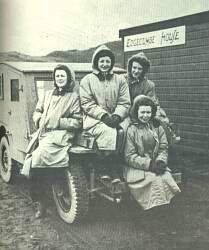 Nurses in Alaska wore winter-proof parkas and four-clasp galoshes. Navy Nurses wearing "Arctic fashion"
The coat is the army nurse's para-type overcoat. .